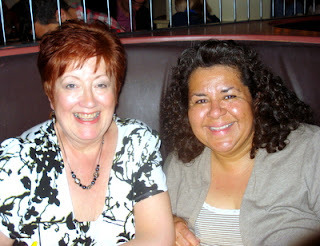 Just wanted to tell you about a lovely evening I had last night with one of my DT colleagues from Creations by Gill McCall. Naomi lives in Colorado and won a trip to London for the 3D showing of Titanic. 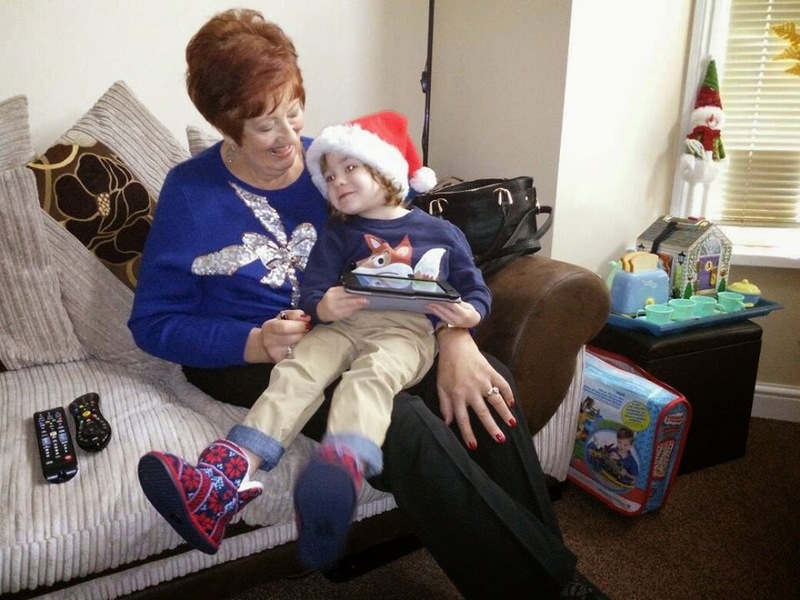 She decided to make a holiday of it and brought her lovely family with her. We thought it would be great to meet up and take a photo for the other DT members. Naomi gave me a beautiful box with little gift cards inside that she had made especially for me:) Do checkout Naomi's blog as she is extremely creative and would love you to follow her. Isn't it absolutely beautiful? I had a little gift for Naomi as well, it was not something I had created myself but a set of Papermania London stamps which I thought would come in handy as Naomi is a great scrapbooker! 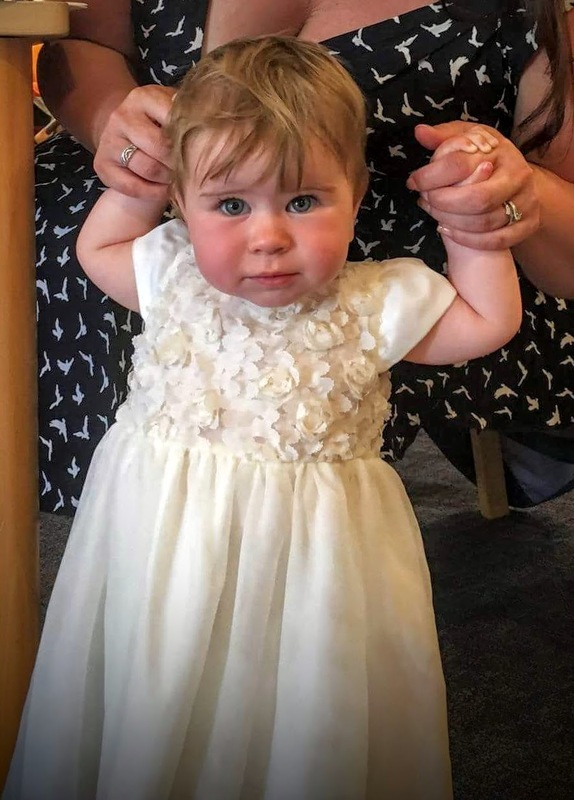 Now this could be a number of things: Easter (New Life in the church), New Baby (human or animal - think lambs, chicks or bunnies), A New Life Together or even a New Home. My base card is a pre patterned glossy card from my stash. I cut it down to 5" x 5" and folded a corner down, cut off the end and secured it with brads. I cut out a birdhouse shape, punched out flowers and the bird and branch from SU all in the piece of leftover card. 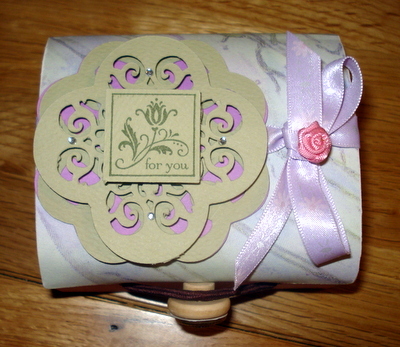 I moulded the flowers and added a pearl to each centre and the sentiment is from my xyron digital runner. The little bird is from Everything Eleanor SU set. Help too much choice!! This week the LIM theme is TAKE THREE CHALLENGES. There is a list of all the past challenges at the top of the LIM blog and you can take any three for your card. 58 to choose from help! 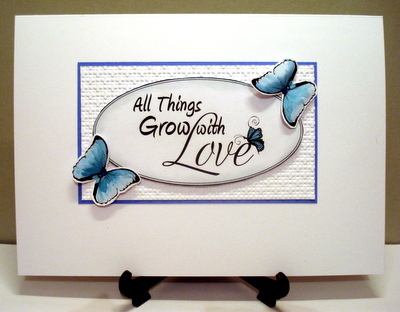 The main image is a digital sentiment that I cut out and sponged the edges with Stormy Sky DI and painted the butterfly with Marina Mist SU ink. 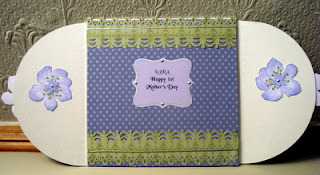 It is mounted onto card embossed with an SU EF and mounted onto blue card. The other butterflies are painted, moulded and popped up with silicone glue. All the pieces came from my scrap bag. 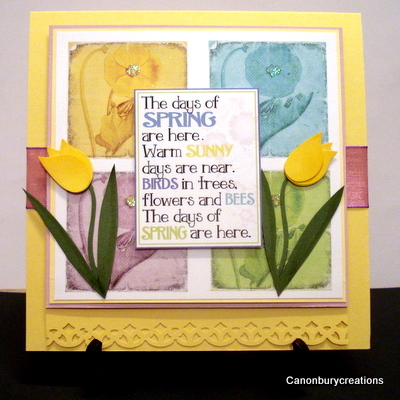 Over at MMM the theme of SPRING is continuing but this week we've been asked to make a SPRING FOLD card. 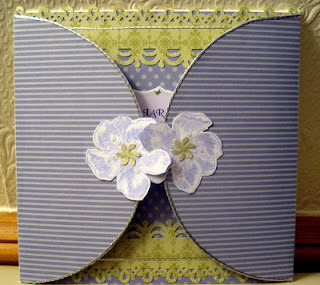 Coincidently I did a similar card for my DT challenge at the beginning of March. I used mauve base card and matted some Anna Griffin paper on the base and on the topper. I cut out some of the flowers for decoupage and a large one for the centre which is two flowers moulded together with a gem in the centre. The four corners were stamped with a clarity corner stamp with versamark ink. The postage stamp is a very old one from Stamp Addicts as is the daisy, which is a four sided one called Carol's cube. 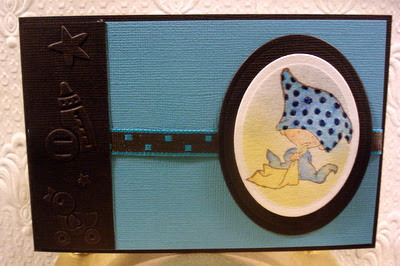 I stamped the postage stamp in black onto the card base and then onto a post it. 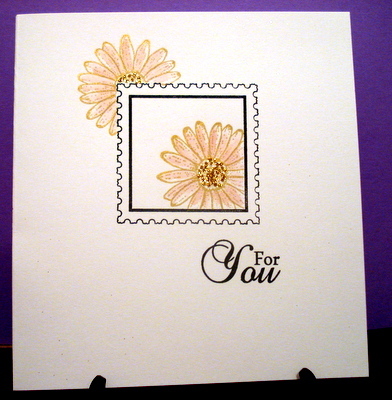 I cut out the centre panel and stamped the daisy in gold ink off the edge. I cut around the top of the mask and stamped another daisy. I used a water pen to colour in using SU Pretty Pirouette. I added gold glitter to the centre of the flowers. The sentiment is from a set by Sheena Douglass. It looks slightly skewed in the photo but not IRL! 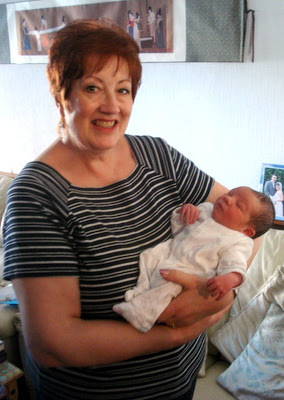 As some of you may have noticed I recently became a grandmother :)) and this resulted in us receiving congratulatory cards, two of which I'd like to show you. 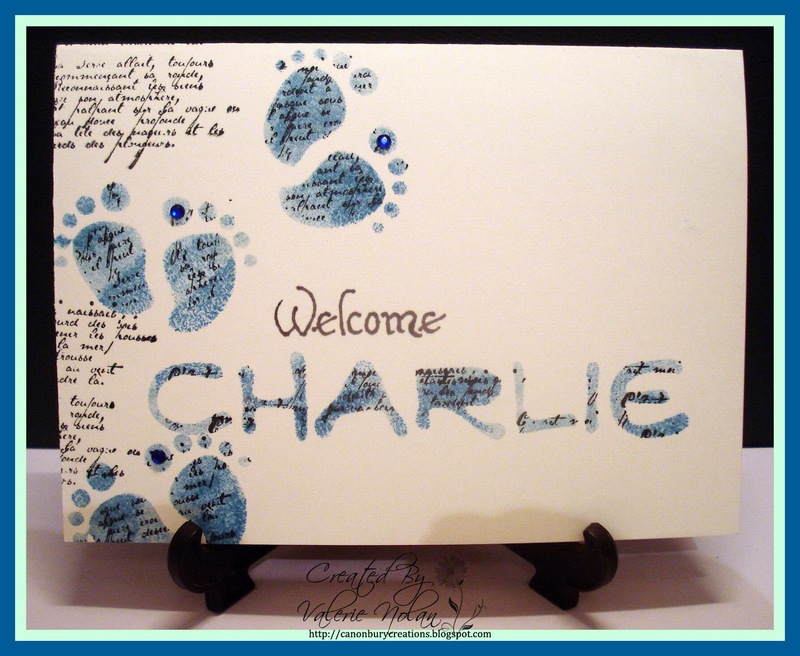 The first is from my sister Karen, whose blog you may be aware of, and it has a photo of Charlie on the front along with some lovely embellishments. 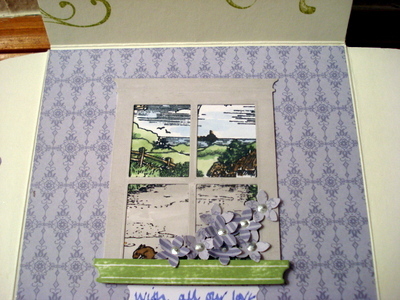 The next card was a lovely surprise from Christine, who lives in Belgium. We follow each others blogs and have exchanged cards once before, she creates beautiful cards and I was delighted to receive this one: Isn't it cute? I've used SU papers and Everything Eleanor stamps. It resembles a shaped gate fold but when it opens the inside flap lifts up. I used Anna Griffin punches on the green paper. The window frame is a die and I cut the bottom off and popped it up to create a window box. The scenes is a Pilkington Lane stamp coloured with PM's. The flowers are a little punch with a pearly dot in the centre. 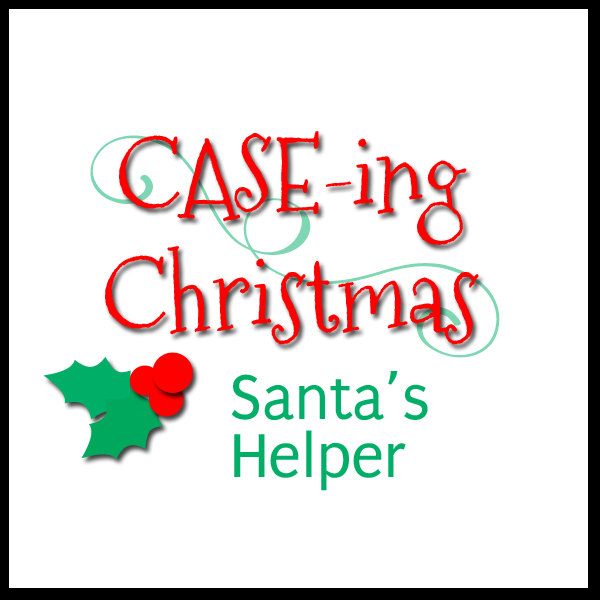 Since the "My Fair Lady" blog hop this morning my followers have risen to 101 and the person who tipped me over to 101 is Sharon, who has also awarded my blog the Leibster award. 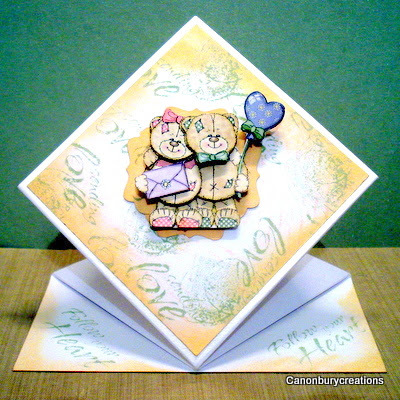 I'd like to thank Sharon for this award and encourage you to check out her blog as she was cardmaker of the year 2011 for the Cardmaking and Papercraft magazine! How the Leibster blog award works. The idea of this award is to spread love from one small blog (less than 200 followers) to another. This helps to spread knowledge and readership. 3. Give the award to 5 bloggers whose work you admire. 4. Leave a comment on their blog to let them know they have been chosen. 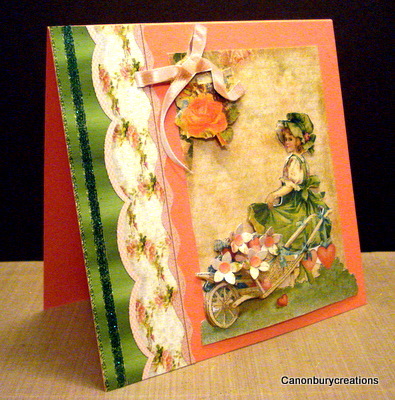 Welcome everyone to the My Fair Lady blog hop hosted by Gill McCall. 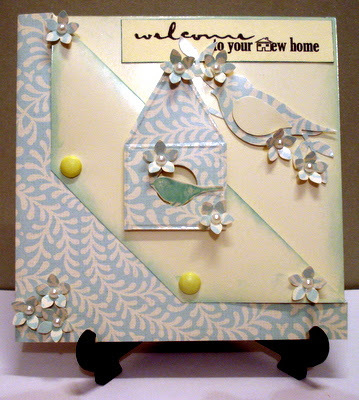 If you have arrived here from .Linda S - http://lindasimpsoncraftypieceofheaven.blogspot.com/ then you are hopping in the right direction but if you have just happened upon my blog and would like to start from the beginning please start here. 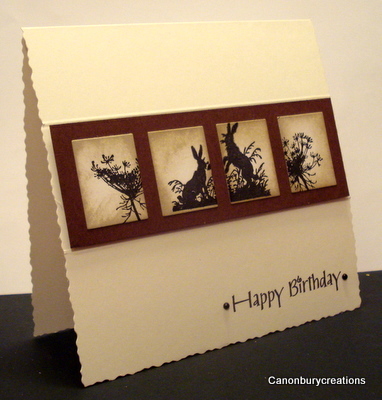 I have made three cards for this hop and and they are all different and I hope you like them. 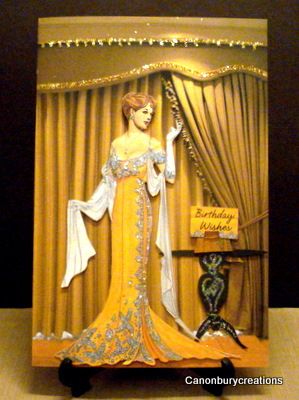 This card is made with images and background from a cd called Cocktail Dreams by Hinny Bop designs. The backdrop I have embellished with gold glitter and the lady is pop dotted and all the silver jewels on her gown are silver glittered. This card is a download and I decoupaged the little girl and the wheelbarrow. I punched out some flowers for the barrow. The base card is SU card stock. 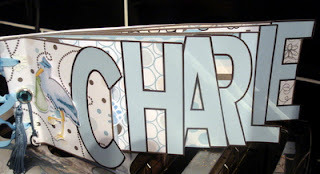 Just had an idea for the waste that was left over making the frame for Charlie, which you can see here. I sponged Marina Mist onto the footprints and the name and stamped the script from French Foliage in black through the stencils and down the side. I hand wrote Welcome in slate PM. I added a couple of gems to the big toes, big being the operative word, Charlie has large feet!! Just a quick post to show my card for this weeks challenge over at MMM. 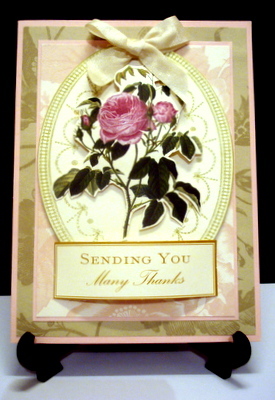 The theme is still Spring but this week it is a Mother's Day card or a Thank you card. Anyway here it is and hopefully it's suitable for the theme. 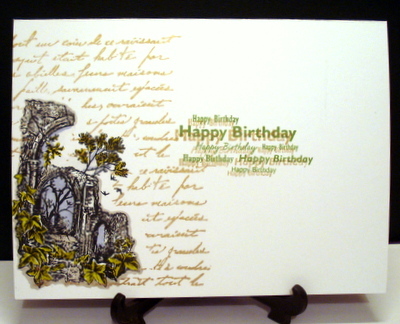 The challenge over at Less is More is a one layer card theme and we are to use SCRIPT in any form, even handwritten but there must be a sentiment as well. This was my 3rd attempt as I kept stamping the text upside down! The stamps are from a vintage set by Stamp Addicts and the sentiment is from an old seedee set The script is stamped in gold ink and the ruin scene is in black memento. The sentiment is wild wasabi overstamped with gold. I used PM's to colour the image. 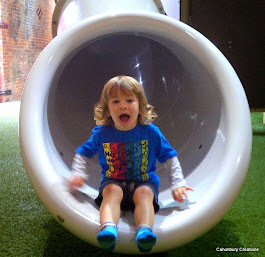 Thanks for taking the time to visit and hopefully leaving a comment. 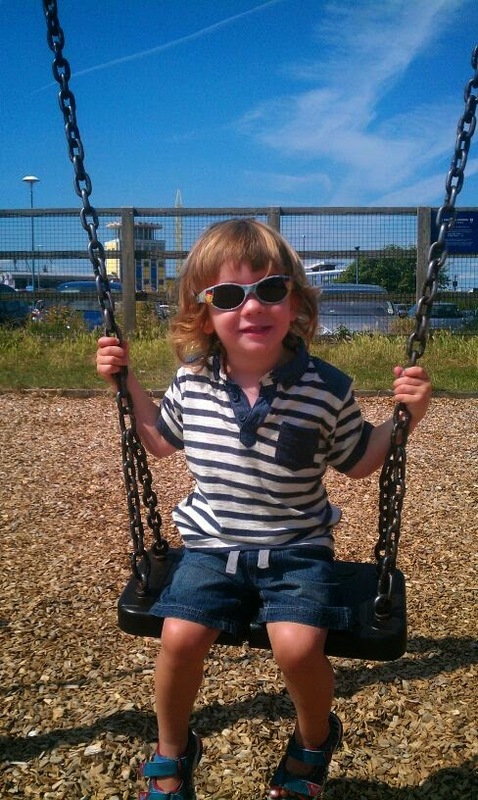 Many thanks for all the lovely comments that have been left about Charlie, I loved them!! Hope I'm not boring you! Hi everyone, just got back this evening from Portsmouth and my first cuddles with Charlie:) He is gorgeous and a very contented baby and I've yet to hear him cry! I had made a box frame for Charlie's nursery and was waiting with all the numbers cut for every date eventuality and the two names that had been chosen for a boy or a girl! looks really nice in the nursery. I made a word card very quickly to take down with us using Funky Daze Paercraft cd. In such a hurry I forgot to take any photos, so this was in situ. 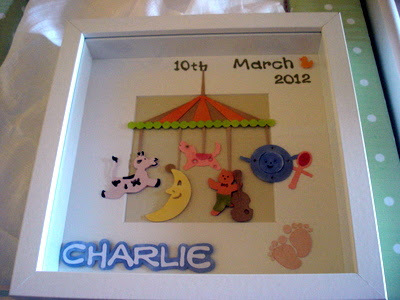 There were lots of embellishments inside along with Charlie's first photo. 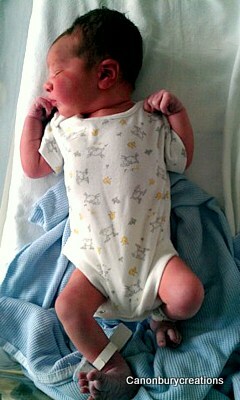 Baby Charlie was born today at midday, he weighed 7lb 10ozs and mother and baby are very well! 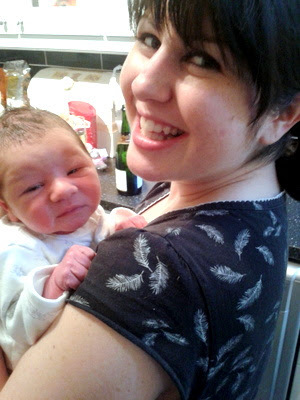 Nanna Val is very excited and looking forward to my first cuddle :) Off to make a card now and hopefully off to Portsmouth tomorrow! Hi everyone, well it's not the Oscars but awards are definitely in the air! The fabulous SASHA has awarded me with the Liebster Award and I was delighted to accept it:) do check out her blog she makes beautiful cards and projects and they always are embellished with a fabulous bow! 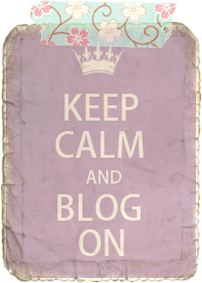 Reveal your five chosen bloggers and let them know. Hope that those you honour pass it on to their favourite bloggers. What a horrible day very windy and loads of rain! The postie arrived with a few eBay goodies and as I'm trying to keep busy I thought I'd have another go at this weeks LIM challenge which is using NEUTRALS. 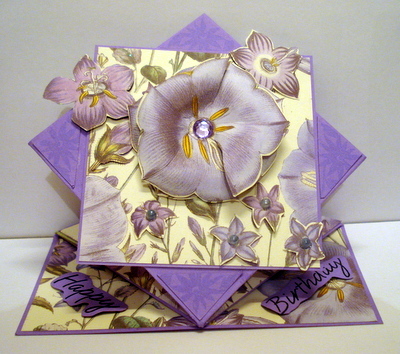 I've used SU Botanical Blossoms, which is a duo stamp set matted onto core'dinations which I tore to match the shape of the topper. A couple of black gems and a sentiment to finish. 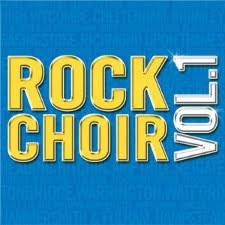 Off to Aquafit now and Rock choir later so that will keep me from thinking babies all the time! Evening all, well I'm still waiting for that phone call!! In the mean time I thought I'd better get on with the new LIM challenge which is a colour one and this time Chrissie and Mandi want us to use NEUTRALS. That covers off white to black with any shade of beige, brown or grey in between. 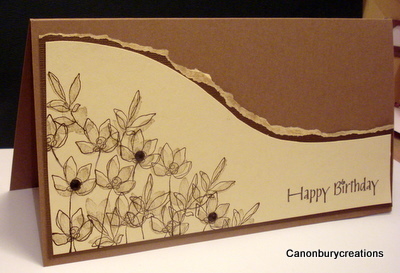 This is a cream pearlised base card with a strip of brown card stock across the centre. The small rectangles were distressed with Crumb Cake and Soft Suede and then the middle two were stamped with this month's freebie from Craft Stamper. The other stamp is fennel seed heads by Craft Fairy. The sentiment is from my xyron printer and finished with 2 black pearls. 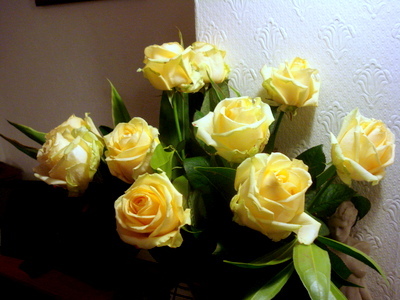 Evening everyone and a special welcome to two new followers, Donna H and Lunar10575. Well no baby news yet I'm afraid but every time the phone rings I jump!! 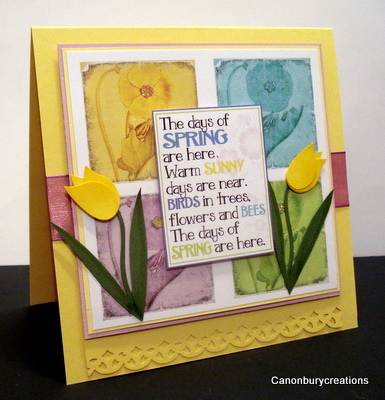 The theme this month at MMM is SPRING and the challenge this week is SPRING FLOWERS. Now I knew immediately what I wanted to do, not that that always works out! Paulette at TLC had some lovely papers last week and yesterday she had a spring sentiment and on Saturday the amazing Vicky Hayes (check out her fabulous blog) used the SU bird and branch punch to make tulips from the wings. 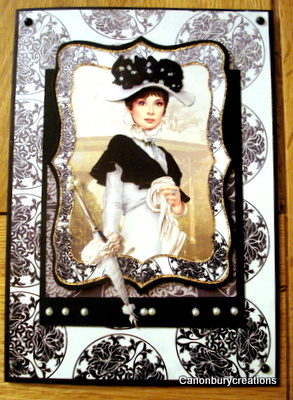 The base card is 6" square and the papers from TLC I resized in Craft Artist. I pop dotted the sentiment and added some glitter to the centre of the flowers. The ribbon is from Mei Flower and the tulips were made from the wings that I punched out. I cut the leaves free hand. I added a punched edge to finish. 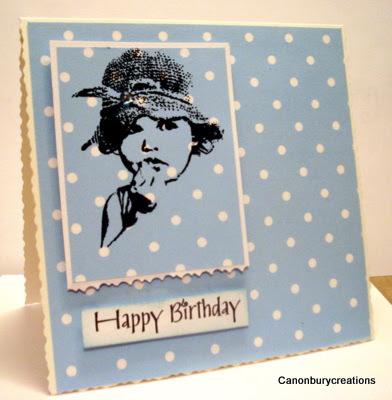 Check out the fabulous DT cards on the MMM blog they are gorgeous! 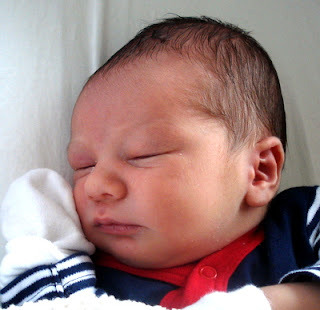 I hope to have news of my first grandchild on your next visit, you can be sure I will be letting everyone know!!! I used pearl card and sponged it with Spun Sugar and Antique Line DI. The diamond I stamped with Darkroom Door Love Letter stamps and the decoupage is a freebie that I found on the internet ages ago and I printed it out and mounted it up. The sentiments were stamped in Versamagic Spanish Olive. 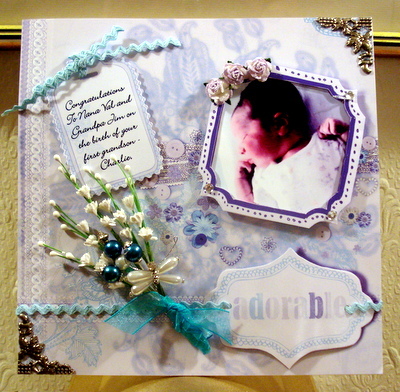 Hope you like my card and for more inspiration check out the other DT cards on CBGM. Less is More week 56 Don't scrap it! Wow I'm running really late this week for the LIM challenge. Chrissie and Mandi want us to use our left over bits and pieces to make a card. Well all my scraps go in a carrier bag and eventually when it gets too full the recycle bin gets them! I do use the scraplings for bookmarks but as for the rest...............! it was in the bottom of my bits bag. I had stamped it for another LIM challenge last year but never used it. I had one sheet left of the dotty paper and thought it would look better mounted on that rather than plain white. Hope it still qualifies for the challenge? Sentiment is printed on my xyron printer. 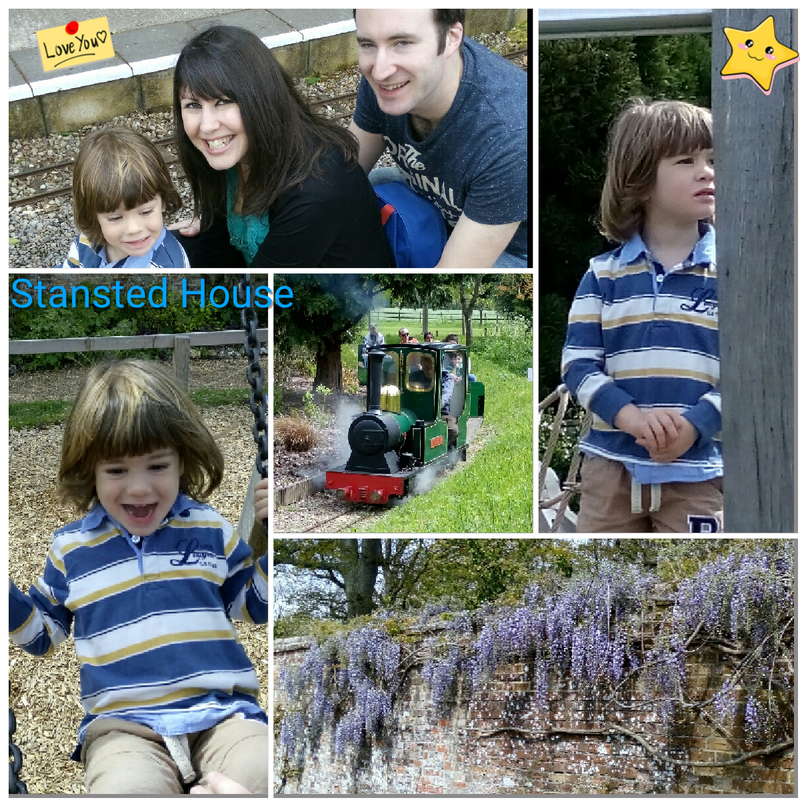 Just found out that I came TOP 3 in the Sir Stampalot challenge last week and it's thanks to Sally H who encouraged me to enter! 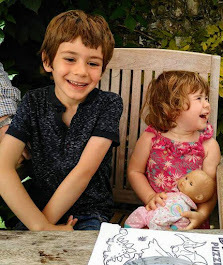 Hi everyone, sorry if I've missed commenting on your blogs this week but we were in Portsmouth for a long weekend and things have been very busy here. 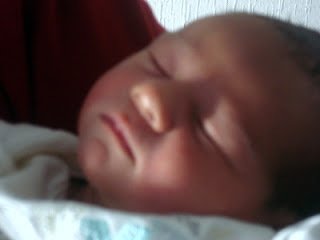 No baby yet............! 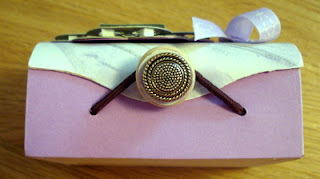 Anyway it's the last week of ROMANCE over at Make My Monday and they have asked us to use FLOURISHES and DIAMONDS. I was going to combine it with the Less is More challenge but my card is not CAS enough but all the components are leftovers from other cards! 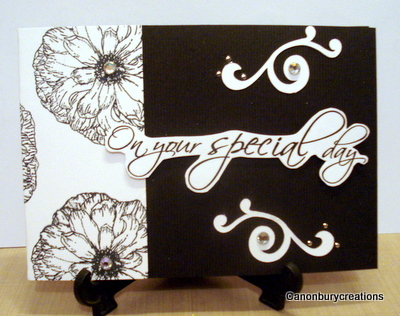 The base card is black ribbed card stock and the strip on the left is a piece stamped with a flower in black Memento and leftover from another card. The flourishes are cut on my Silhouette and highlighted with clear gems. The sentiment is computer generated, fussy cut and popped up on foam dots. Gems are also applied to the centre of the flower.